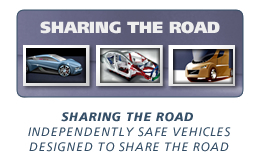 The 2007 Michelin Challenge Design theme encouraged looking for design impact on safety solutions. 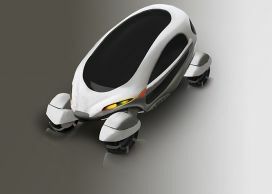 Designers were challenged to create vehicles that were independently safe and could share the road with all types of passenger vehicles, trucks, motorcycles, and pedestrians. This challenge pushed for solutions targeted at the North American market. From 266 registrations, the jury selected 22 drawings and 8 scale models for the Michelin Challenge Design 2007 North American International Auto Show display. Full-size safety solutions were also on display in the Volvo 3CC Safety Car concept, the Fiat Scratch from Uros Pavasovic, Honda’s Civic ACE body structure, and the Revolver concept from Polaris Industries. Design Team: Polaris Industries, Inc.